14"x12"x7.25" is a lot of tote. 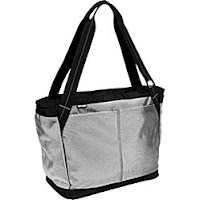 You can fit your laptop in here, and also your purse dog, your water bottles (there are end pockets for them, yay! ), your cell phone, your travel pillow, your backup travel pillow, your collection of small weird rocks, your frisbee, and whatever else you deem necessary for an average day. The only trouble may be picking it up after you've filled it up. From Ebags.